That guy was board to sleep. It’s “Culture Club”, dude. Get it right. And why are you beating up Boy George’s agent again? Wak-jobs aside, that has got to be grammatically incorrect. This is just all wrong. Not only has this guy got a hate on for Boy George, but he’s grossly unfamiliar with anachronistic pop-culture. 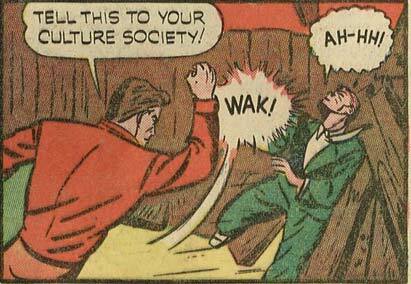 I mean, he gets Culture Club wrong, and he’s actually attacking Ah-Ha’s agent! Just the poor guy couldn’t get the whole band name out before… Well, y’know. So true. When greenie said “Take on me” , red understood “take me on”, and next thing you know there’s extreme backyard wrestling….